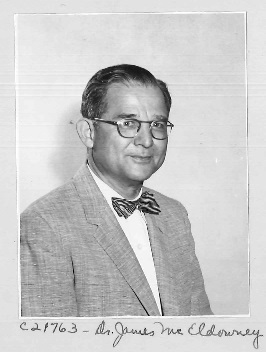 Board of Missions of the Methodist Church , “Mission Photograph Album – Portraits #10 Page 0084,” UMC Digital Galleries, accessed November 27, 2018, http://catalog.gcah.org/omeka/items/show/61171. 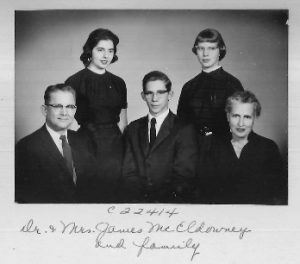 James E. McEldowney represents the classical missionary story of the early twentieth century. At a student volunteer meeting in Detroit in 1927, he pledged to be a missionary. Stories of the needs of the people inspired him. He continued his education, thinking that he might be going to China when he finished. But by 1935, the Japanese were already there, and the Board of Foreign Missions of the Methodist Episcopal Church asked him to go to India. Before he went, he studied carefully what people were saying about missions, both pro and con. He believed that his job was to train Indians to be leaders in the church. After three years of ministry in a city church, he moved to Jubbulpore, a large city in the middle of the country. He joined the faculty of Leonard Theological School, one of the primary training centers for clergy and church workers in the northern part of India. The school was built on the grounds of the estate of a former British official and formed its own community. Most of the faculty had homes on the school grounds, contributing to a feeling of community or a large family. After two years, he took a furlough to finish his doctorate. When he finished, the Second World War was still raging, but he chose to return to India even though his wife and children had to stay behind. Board of Missions of the Methodist Church , “Mission Photograph Album – Portraits #10 Page 0135,” UMC Digital Galleries, accessed November 27, 2018, http://catalog.gcah.org/omeka/items/show/61222. As he worked among the Indians, McEldowney grew in appreciation of the lives of people of faith, whether Hindu, Christian, or Muslim. At the same time, he was aware that many Christians were not living up to their ideals. He did not believe that his job was to go out into the streets and try to convince people to become Christian. Instead, he drew on a particular Hindu method to develop a special kind of ministry in addition to his teaching. Hinduism used plays recounting the lives of gods and goddesses to teach. McEldowney began to write scripts of Christian stories to be used for telling the good news. He began to do a lot of photography and arranged to have the scripts made into films. He also worked with students to use flannel boards, taking them out into the villages to provide both entertainment and witness in the large rural area around Jubbulpore. Working in India presented challenges. In addition to the unreliable availability of electricity and telephones, people often had to make do with a more limited range of materials and supplies. Yet one of the things that impressed him most about the India people was their ability to take what they had and make something beautiful. McEldowney had his own experiences of making do. Scenery for films was made of papier-mache. One day he and his associates worked on a wall, leaving it partially finished when they went home for the night. The next morning they returned to find that termites had already eaten half of it. Eventually they learned that adding sulphur oxide to the paste kept the termites from devouring their work. Looking back over his life, McEldowney felt great satisfaction in the lives that he touched. He was part of the transitional time for missionaries. When he started, mission work was the outreach of the church, and missionaries were really needed. By the time he was done, missionaries knew that their efforts and gifts were best directed to the development of indigenous leaders. Taken from Linda Gesling, Mirror and Beacon: The History of Mission of The Methodist Church, 1939-1968. (New York: General Board of Global Ministries, The United Methodist Church, 2005), p. 50-51. Enter your email to stay updated on new stories.